I started a new quilt yesterday. Yep, I've been finishing or moving along UFOs quite a bit over the last three months. But you see that button Hands 2 Help? I volunteered to make a quilt to send to International Institute St. Louis whose mission is to help immigrants and their families become productive Americans and champion ethnic diversity as a cultural and economic strength. I feel making a quilt for this organization will help to counter growing negativity towards immigrants in America. I realized they would prefer a twin size quilt. Yikes, that's a lot of work to make one -- especially if it needs to be done by mid May. But, on rereading the info on Hands 2 Help I realize I have the date a bit earlier than the mailing date of June 2 or so. Phew. I had fallen in love with Sarah's first Stunning Stars quilt called Scrappy Stars. Take a minute to go look at her quilt and some of the quilts that inspired her at her blog, Confessions of A Fabric Addict. 🎵♪🎵🎵♪ Ok, are you back? Isn't that a great quilt? So I did a little blog surfing to see some other examples of great star quilts with either 9 patches or a variety of patches. Here's my version drawn in EQ but the coloring is very questionable although I hope to use those colors in the real version. My plan is to use navy blue solid for the stars, with the other blocks to be 9 patches except I was going to plop whatever color patch I have into the blocks. According to EQ this will be 68 x 92" I had a slightly smaller version that was going to use 425 4" blocks for the 9 patches. I'm sure I'll have to cut even more. I've got 100 4" blocks and all of the navy blue blocks and half square triangles done. Unfortunately, I've actually gone through at least half of the fabrics I've pulled for the quilt. YIKES! On the other hand, I only pulled fabrics from my fat quarter collection so I still have yardage I can hit up. Knowing I want these fabrics to be totally mixed up I don't plan on starting the project until every thing is all cut out. Needless to say this is going to be great for my fabric usage when I'm done with this one. That's my plan for Hands 2 Help. Do you want to make a quilt too? It isn't too late to join in. Click on the link above and see what is involved and, did I mention there are some prizes? Nothing like prizes (and a good cause) to motivate me! Here's last week's goals. Not bad but I must get that tangram block done! And, now what I hope to accomplish this week. That's it for me. I'm linking up with Monday Making, Main Crush Monday and Moving It Forward when it is posted. Enjoy some tea and browse these great sites. I love the Hands 2 Help program. I need to start working on my choice for that. LOVE the stars pattern you're using - that's perfect for the St. Louis site. Your design is definitely a stash/scrap buster, and I love it. I've got my tea ready and off to check out your links. Oh, I agree about Stunning Stars! I'll look into Hands2Help. 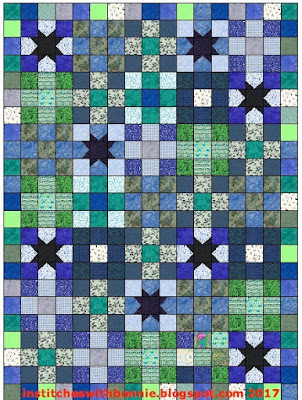 I recently read about another charity quilt project but darned if I can remember which blogger recommended it. that looks like it will be a great quilt. That's going to be a great quilt! The pattern looks like a good stash burner! It's going to be a very pretty quilt when it's all done.